Car Chem Car-Chem Ltd have an extensive range of the highest quality car care products on the market, whether it is for interior freshness or exterior shine, Car-Chem know that attention to detail is of the most importance, here at Car-Chem we will strive to make sure you and your car have our upmost attention with our extensive car treatment product range which will guarantee your car looks back to its show room shine. Unlike many car care companies we formulate and manufacture everything ourselves, we feel this gives us an advantage over our competitors as we have the facility and machinery to achieve consistency, quality and versatility. 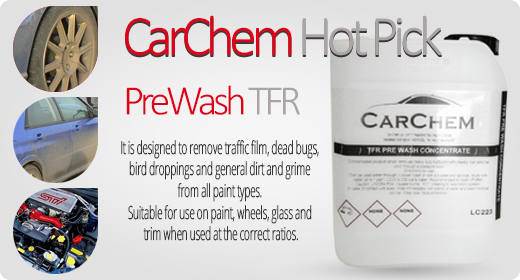 CarChem Super Concentrated Pre Wash TFR (Traffic Film Remover) . It is designed to remove traffic film, dead bugs, bird droppings and general dirt and grime from all paint types. Suitable for use on paint, wheels, glass and trim when used at the correct ratios. Can be applied via low pressure hand sprayers, through high pressure washing equipment or manually with a brush / cloth and bucket. Leave on for a few minutes to activate before thoroughly rinsing off. Do not allow to dry. Always test your dilution ratios on a small area before progressing to the whole area. This product WILL remove wax at strong dilution ratios. One 5ltr will make up over 250ltrs of ready to use product.